Here are some of my past projects, some of which were produced and some of which were never fully developed, but a variety of flavors. Katie and I wrote this piece as part of the 2015 iteration of 4@15: Four Fifteen Minute Musicals, where four writing teams each have two weeks to write a short musical for a cast of 8 students from NYU Steinhardt. While we were brainstorming ideas for the kinds of stories we could tell in 15 minutes, everything from Secret Society Inductions to the tribulations of Underground Hacker Communities, I remembered a New York Times article I'd read about a private company trying to send the first humans to Mars. The article had stuck with me because the opportunity was specifically meant as a one-way trip to Mars, meaning the people chosen would spend the rest of their lives there in order to start a colony. The fascinating part was that the majority of experts in the scientific community found the prospect ludicrous, claiming that the technology to get humans to Mars was still primitive let alone the technology needed for people to live there and survive was virtually non-existent. Despite most scientists laughing this company off as a joke, hundreds of thousands around the world were already applying for one of the four spots (two men, two women). And not only that, they were applying to be a part of a process that included 10 years of training before the big voyage even begins. Who are these people willing to give away their lives when the experts were calling foul? This show could have easily been written as a mockery of the deluded applicants, but instead we wanted to give both sides a voice. Over the course of history, true pioneers have always been doubted and mocked before ultimately proving everyone wrong. Here's hoping MARS ONE proves to be one of those pioneers. Presented by 4@15 and the University of California, Irvine - featured in Broadway World. This was a piece written over the course of three days, then rehearsed and performed in front of an audience at NYMF that same week. 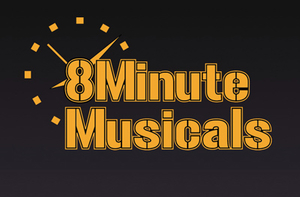 8 Minute Musicals was a production of Artist's Without Limits (AWOL) where composers and playwrights who had never met were paired off, given 3 performers, and had 2 days to write an original 8 minute piece of theater for them. I had a day to notate the score before handing it off to a director and the actors, who then had three days to rehearse before premiering the piece at the festival. I was lucky to work with the playwright Jerome A. Parker and the wonderful David Alpert as my director. The cast included the talented Sally Wilfert, Leah Horowitz and Caesar Samayoa with John Bell music directing. Set in an underground chamber where three people spend their entire existence working a machine they have been told keeps the sun in the sky. As far as they know, to stop would mean the end of the world. Loosely based on Plato's The Cave, "The Earth" explores the individual's quest for the truth and the struggle to reconcile one's own view of reality with reality itself. STORY: When Sam Abrams first fell in love with Rose he wrote her a song— a song that has been covered by every recording artist and translated to every language. It is heard in every elevator and on every cell phone ringtone. For twenty-five years, Sam has been trying to write the next song – to no avail. Sam and Rose are now celebrating their twenty-fifth wedding anniversary with a cruise in the Mediterranean. Sam hears the most beautiful music ever heard, jumps overboard, and winds up on the Siren’s island. 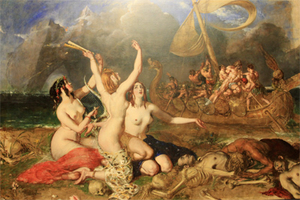 There he must struggle with the seductions of the Siren, the terrors of middle age, and the tortures of creative failure. And he must find a way to get home and win his wife back. The longest performing arts tradition at Columbia University, the Varsity Show is an original musical written, directed, produced and performed by a group of Columbia students every year. The 2008 show, Morningside Hates, marks the first collaboration between me and my best friend and now long time writing partner Kathryn Hathaway. Together we wrote music and lyrics for the original score and taught ourselves to do orchestrations along the way. CLICK HERE to visit the show's official site and listen to the studio recording.